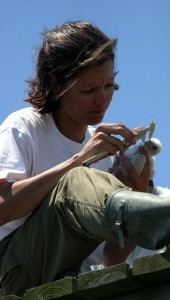 After Peregrine Falcons (Falco peregrinus) were extirpated from much of their North American breeding range due to widespread use of DDT, restoration efforts relied largely on the release of captive-reared individuals. One area targeted heavily for reintroduction was the coastal plain of the Mid-Atlantic. Peregrines hacked onto man-made structures including towers placed in coastal habitat fared well in part because the area supports a large prey base. In fact, this area is internationally important for many shorebird and waterbird species. Many of the species that depend on this area for migration or breeding and represent potential prey of peregrines are of conservation concern. However, the impact of this expanding breeding population on waterbirds of concern remains unstudied. Here we use prey remains coupled with digital video recording to provide the first documentation of the diet of this peregrine population. We found that peregrines utilized a wide array of species but rely heavily on shorebirds (as much as 52% of the diet). In particular, Willets (Tringa semipalmatus), Short-billed Dowitchers (Limnodromus griseus), and Ruddy Turnstones (Arenaria interpres) are used in large numbers. While many species that are considered to be of conservation concern were found to be used as prey items, no species that are listed as Threatened or Endangered or as Highly Imperiled were used.